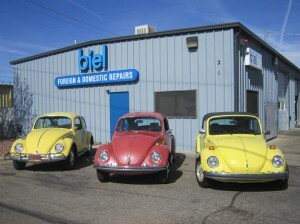 Since 1982 Rich Biel of Biel Foreign & Domestic Repair & Service has been working on Volkswagens. In fact, they are the cars he first learned to fix. Over the last 30 plus years , Rich’s shop has grown into a full service garage, but his passion still lies in his first love; repairing Volkswagens. It’s a little known fact that Volkswagen, also known as VW, means the “peoples’ car” in German. Since the Company was founded 1937, Volkswagen has made it its mission to provide an affordable car that also performs at a high level. Over the years, VW has gone on to produce three of the world’s top selling vehicles including the Beetle, the Golf and the Volkswagen Passat. Whether you drive a the classic Volkswagen Beetle (aka the “Slug Bug”), a turbo-charged Golf or a Diesel-Passat, these automobiles require specialized maintenance from an experienced tech to keep the level of performance you expect. Biel Foreign & Domestic Repair & Service is locally owned and has been Prescott locals “go to” spot for Volkswagen owners for over 30 years. Providing bumper to bumper service, consider us your one stop shop for all Volkswagen repairs and your dealer alternative for factory scheduled maintenance. With state of the art diagnostics equipment, you can trust that we will get the job done right. So whether you’re going on a camping trip in your old VW bus or Westfalia (aka-”Westie”) and need a tune-up or your check engine light just came on in your new Jetta, bring your Volkswagen in Biel Foreign & Domestic Repair & Service today and get it looked at by the best techs in Prescott. Call us to make an appointment today! When your bring your VW into our shop, we check for any issues that could possibly turn into bigger problems down the road. Since our goal is to provide excellent service for you, our customer, we are happy to discuss how to keep your Volkswagen running smoothly as well as what repairs you need now versus what repairs you can do in the future.